Is "more ads" at the top of your mobile wish list? Those of us who regularly go online with our mobile phones are well aware that the mobile internet is slow, annoying and a serious battery hog. Hands up who wants it to be slower, more annoying and even more of a battery hog? You do? Well, you'll be delighted by the news that Flash is coming to phones. And by Flash we don't mean Flash Lite. We mean the full platform. We know what you're thinking. Surely Flash is a good thing, delivering innovative something or other while minimising something else and maximising another couple of things? Quite possibly, and to be fair Flash on phones would deliver some benefits. Developers would be able to write code once and deploy it on Windows Mobile, Palm's Web OS, desktop PCs, Blackberries and other devices without having to write something different for each bit of kit. We'd be able to access Flash video on all kinds of sites, rather than being limited to YouTube like some phones are (cough! iPhone! Cough!). Maybe it'll make it easier for developers to create phone applications, too, thanks to Adobe's AIR technology. And of course, some Flash content is fantastic. The problem, however, is that Flash is often abused. When you browse the web with, say, an iPhone, you'll notice lots of blank spaces where Flash content is supposed to be. What are those spaces for? Ads. When you browse the web on the desktop, more than half of the Flash stuff you'll see – unless you're specifically looking for Flash stuff, of course – is in the form of advertising, usually of the in-your-face, in-front-of-what-you're-trying-to-read variety. We're pretty sure that "more ads" isn't at the top of any mobile web user's wish list. It's not just advertising. Flash is often used – or is that abused? – to make unnecessarily complicated online forms, or to take perfectly decent user interfaces and hide them under a mass of style-over-content nonsense. It's bad enough on a desktop, but on a phone such sites will give you crippling RSI before you've even finished with the front page – and the extra load they'll place on your processor will kill your battery, too. The fundamental problem with Flash is that its many joys are completely at odds with what we use our mobile phones for. Entrancing animation, stylish design and other wonders are great on the desktop, especially when we're wasting time at work, but they're a pain in the backside when we're trying to find facts in a hurry. On mobile, less is more – especially if you're on the same mobile phone network we're on, where downloading even the simplest web page takes around three bazillion years. What's missing? Faster networks, bigger batteries and an easy way to turn off Flash altogether if we don't want it. 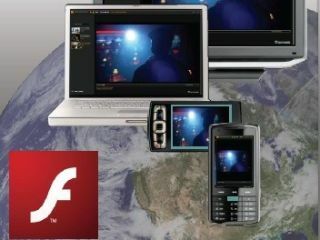 Flash might be ready for mobiles, but we're not convinced mobiles are ready for Flash.